During the last 4, 5 trading days, Big Money has been unloading long positions hand over fist. I've been posting about that on my blog and face book wall. To me that's a sign that this is not a temporary thing and indices could go substantially lower. If this was a temporary sell off, Big Money would have sold future contracts of indices against its long positions instead of closing its long positions out right. Per my plan I added more shorts today to my LT Portfolio. 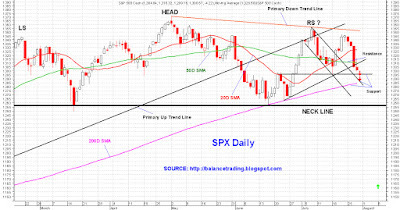 Futures showing SPX at 200D SMA now. Tomorrow could get gully if it becomes clear that Reps can't even pass their own bill in the House. That would mean August 2 might come and go without a raise in debt ceiling. 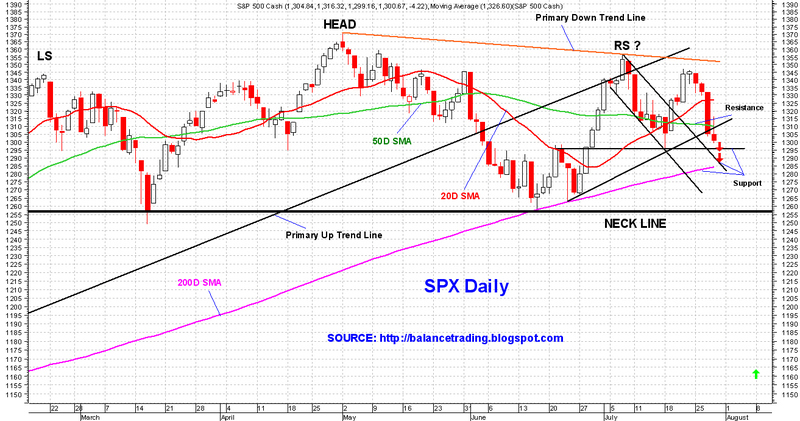 If Reps can't get anything done tomorrow or their bill fails, SPX could sink down intraday to the Neckline, mid1260's. I would cover my shorts should SPX get there.